Here's how to store your lawn and folding chairs so they're out of your way. Take two pieces of 1×4 lumber (any scrap lumber will do) and create some simple, cheap and useful brackets on the wall. Cut each board 7-3/4 in. long with a 30-degree angle on both ends. Fasten pairs of these brackets with three 2-in. screws to the side of the exposed wall studs, directly across from each other, and you've got a perfect place to hang your chairs. 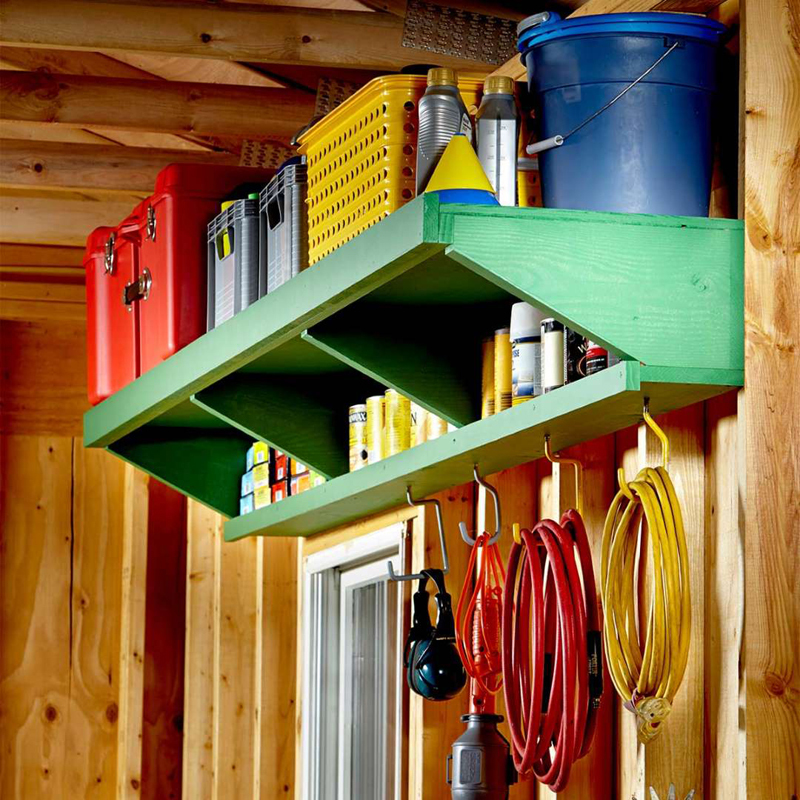 These simple DIY garage shelves can be built in less than a day for less than $300. Tuck medium and lightweight stuff onto shelves suspended from the ceiling. 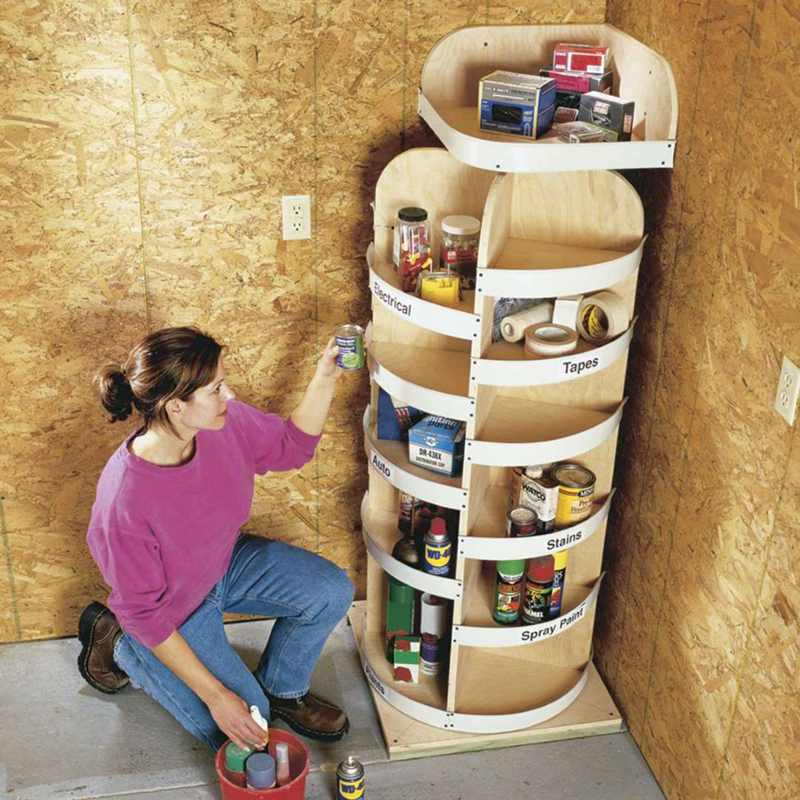 The shelves are designed to fit into that unused space above the garage doors (you need 16 in. of clearance to fit a shelf and standard 12-1/2 in. high plastic bins). However, you can adjust the shelf height and put them anywhere. The only limitation is weight. We designed this 4 x 6-ft. shelf to hold about 160 lbs., a load that typical ceiling framing can safely support. 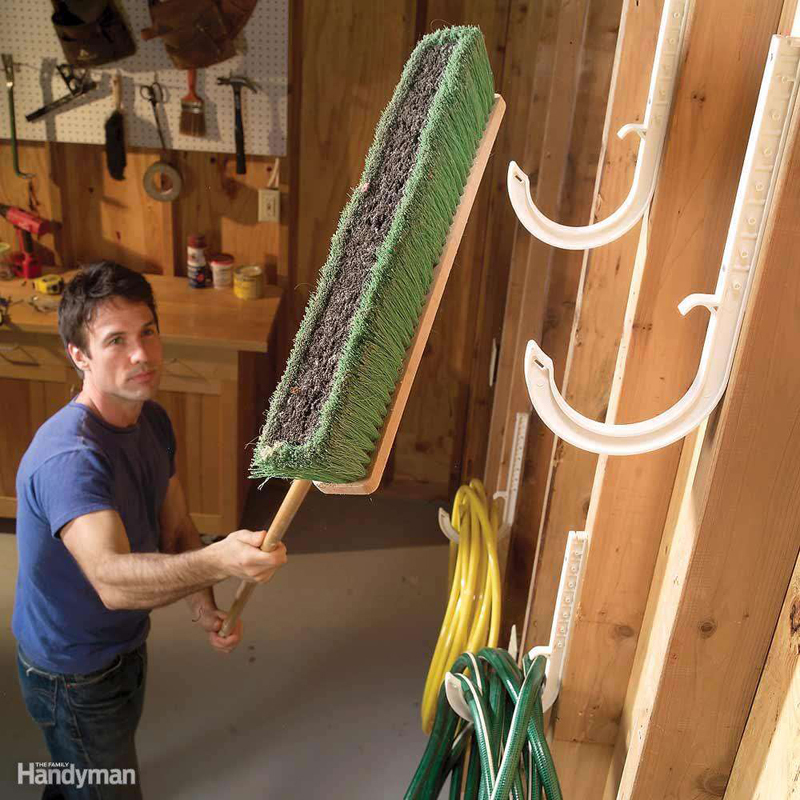 Create a simple long-handled tool hanger out of two 1x4s. On the first one, drill a series of 2-in. holes along the edge of the board. The trick is to center each hole about 1 in. from the edge. That leaves a 1-1/2-in. slot in the front that you can slip the handles through. Space the holes to accommodate whatever it is you're hanging. Screw that board to another 1x4 for the back and add 45-degree brackets to keep it from sagging. 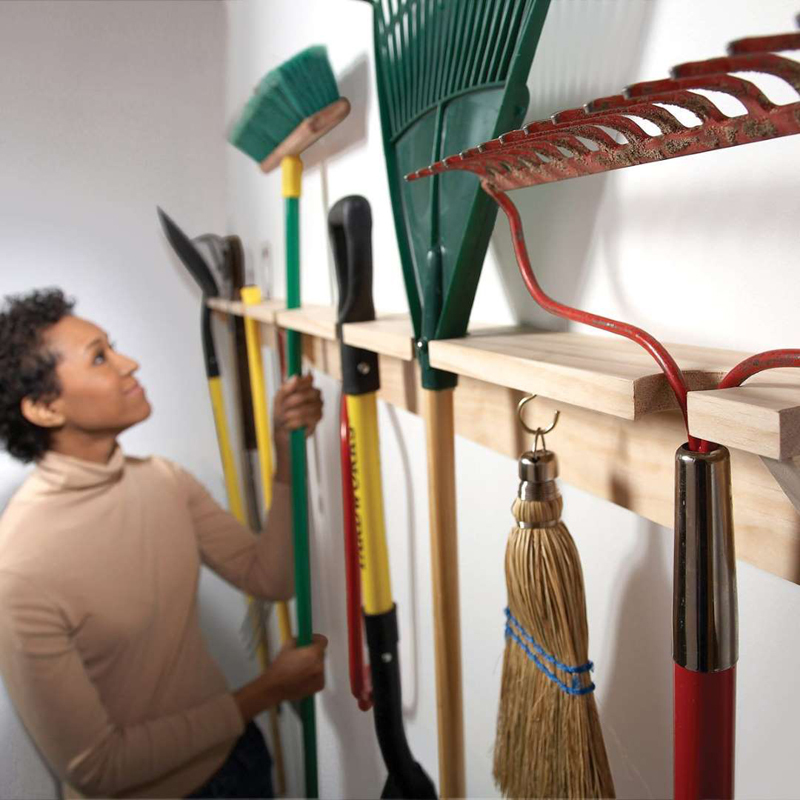 If you wish, pound nails into the vertical board to hang even more stuff. No more tripping over the shovels to get to the rakes! These yard tool hacks will make your life easier. 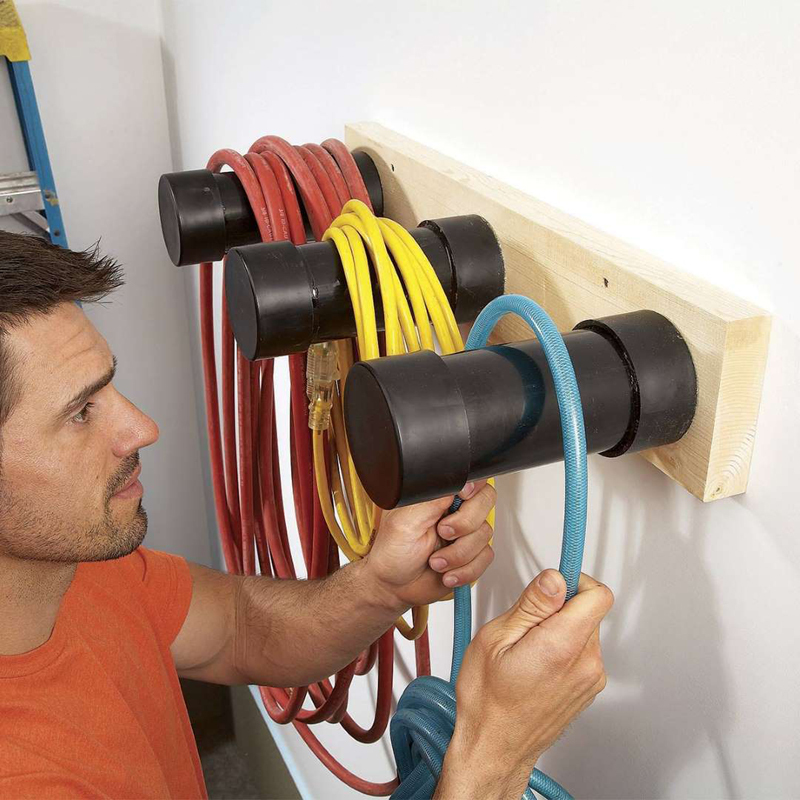 Those plastic hooks that plumbers use to support pipes make convenient hangers for just about anything. They're strong, cheap and come in a range of sizes. Find them in the plumbing aisle at home centers and hardware stores. 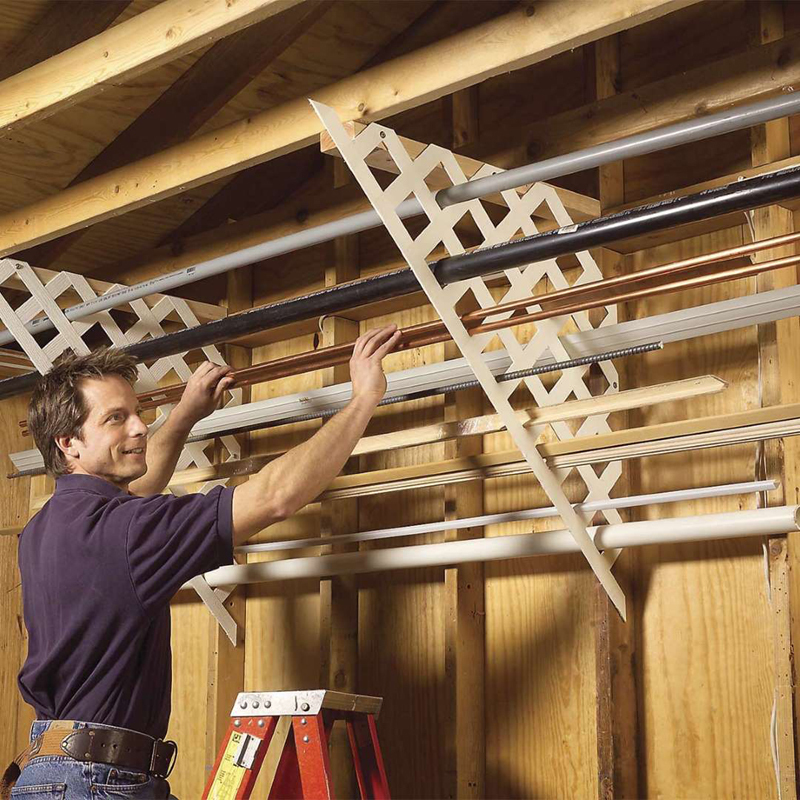 Plastic lattice works well for storing long lengths of miscellaneous pipe, trim, flash-ing and conduit. Just cut matching pieces, then screw 2x4 cleats to the ceiling and screw the lattice to the wall studs and cleats. Now you can quickly find those oddball leftovers instead of going to the hardware store and buying yet another piece. 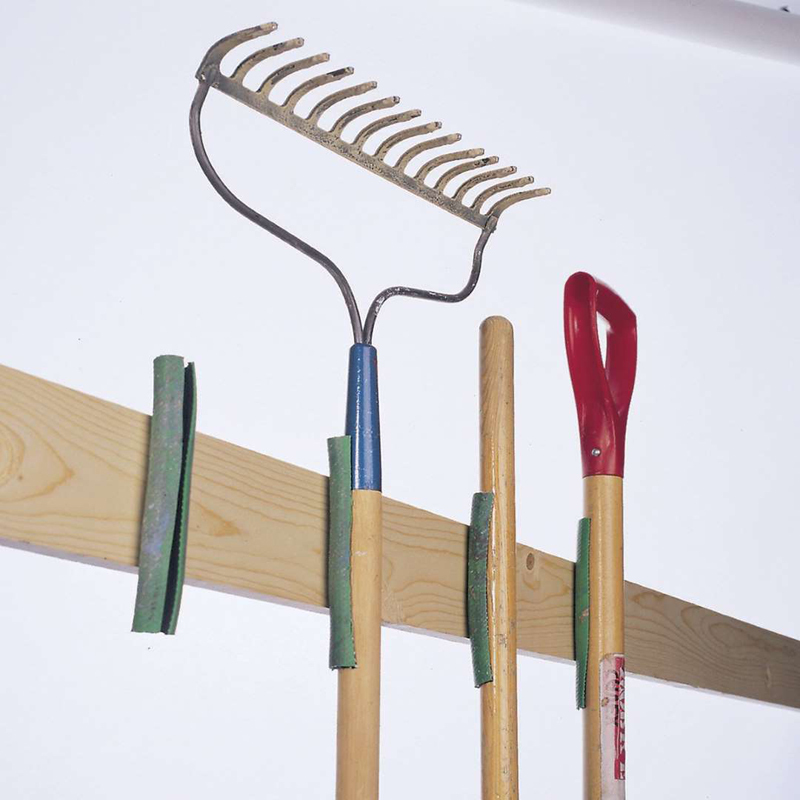 If you have a yard or a garden, you know that there are a lot of long-handled tools involved. You probably also know how obnoxious it is when you need the shovel or the rake and have to walk all over to find it. All you need for this pallet organization hack is a pallet, a couple of screws and a drill. And if you don’t have any pallets lying around, they are easy to get for free. Many businesses will give them to you, but you should call first! Another great place to check is local Craiglist ads. 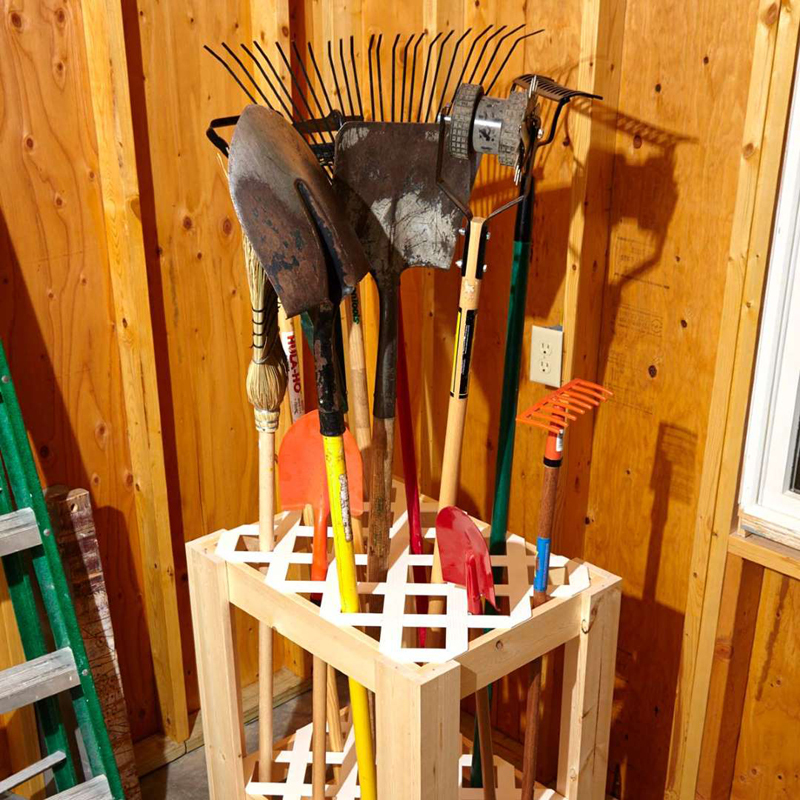 This is a quick one-hour project and after you're done, your tools will be organized and easy to reach.You could easily attach this pallet to a fence, shed or to the exposed wall studs in your garage. No matter what you choose, you'll want to make sure that your screws are long enough to go through both your pallet and the wall you are attaching it to. We drilled two screws into the pallet, one into each exposed wall stud. You won’t need a ton of screws or nails because the pallet isn’t all that heavy. 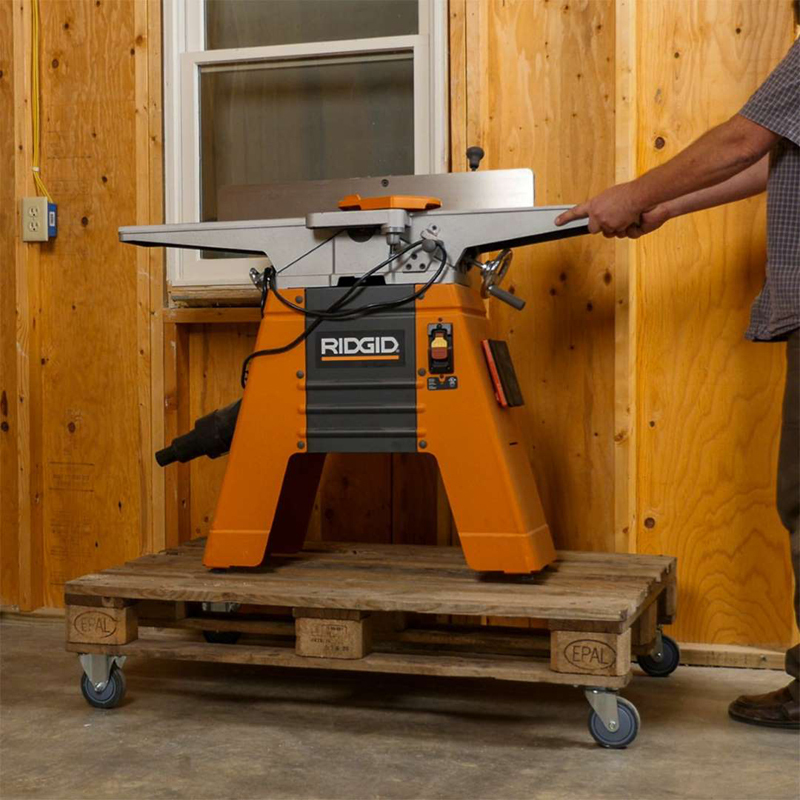 Now you have a quick and (possibly) free way to store your lawn tools!Looking for more ways to work smarter in your workshop? 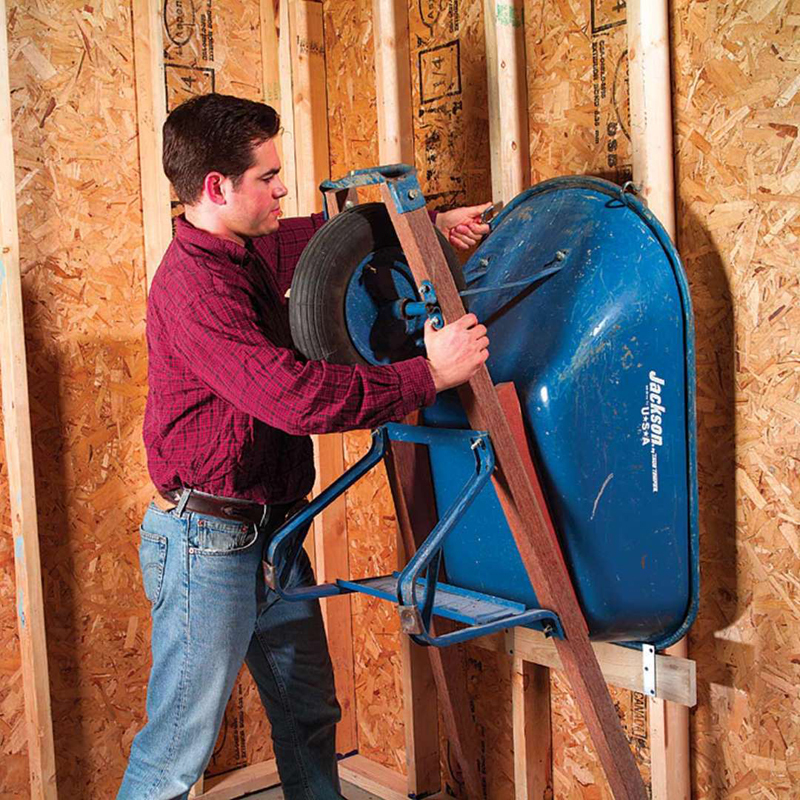 Hang your wheelbarrow on the garage wall to free up floor space. Center a 2-ft. 1x4 across two studs, 2 ft. above the floor. Tack it into place, then drive 3-in. screws through metal mending plates and the 1x4, into the studs. Leave about 3/4 in. of the plate sticking above the 1x4 to catch the rim. Rest the wheelbarrow on the 1x4 as shown, and mark the studs 1 in. above the wheelbarrow bucket. Drill pilot holes and screw ceiling hooks into the studs. Twist the hooks so they catch on the wheelbarrow lip and hold it in place. 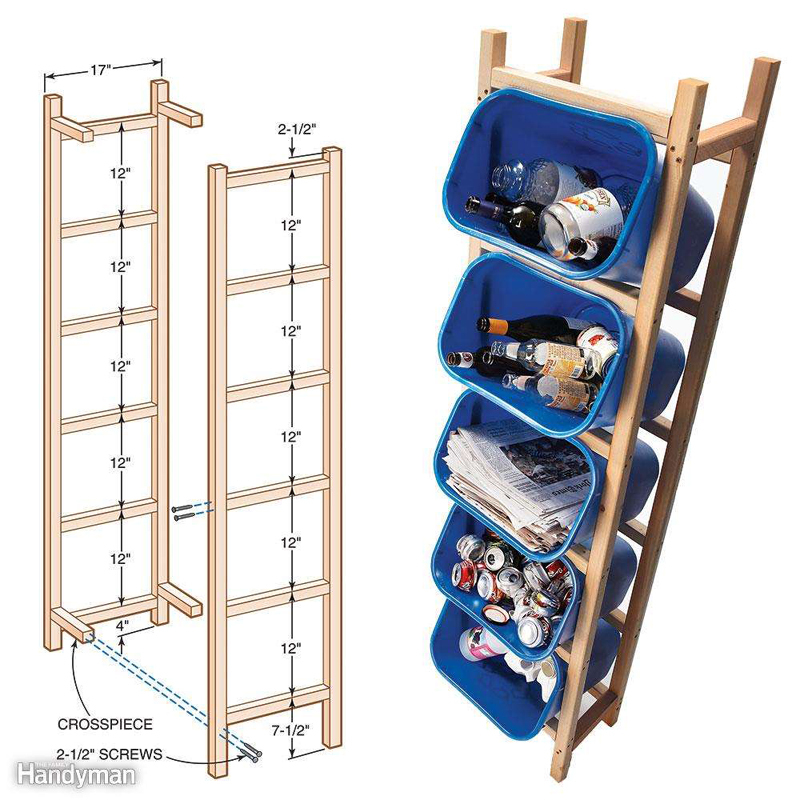 Five plastic containers, six 2x2s and screws, and one hour's work are all it takes to put together this space-saving recycling storage rack. Our frame fits containers that have a top that measures 14-1/2 in. x 10 in. and are 15 in. tall. Our containers were made by Rubbermaid. Drive 2-1/2-in. screws through the uprights into the rungs. Assemble the front and back frames. Then connect them with the side crosspieces. Want even more space in the garage? These shelves put a garage corner to maximum storage use. They spin on two lazy Susans, one on the bottom and one at the top (under the top shelf). They can’t tip because the top shelf is screwed to the wall. 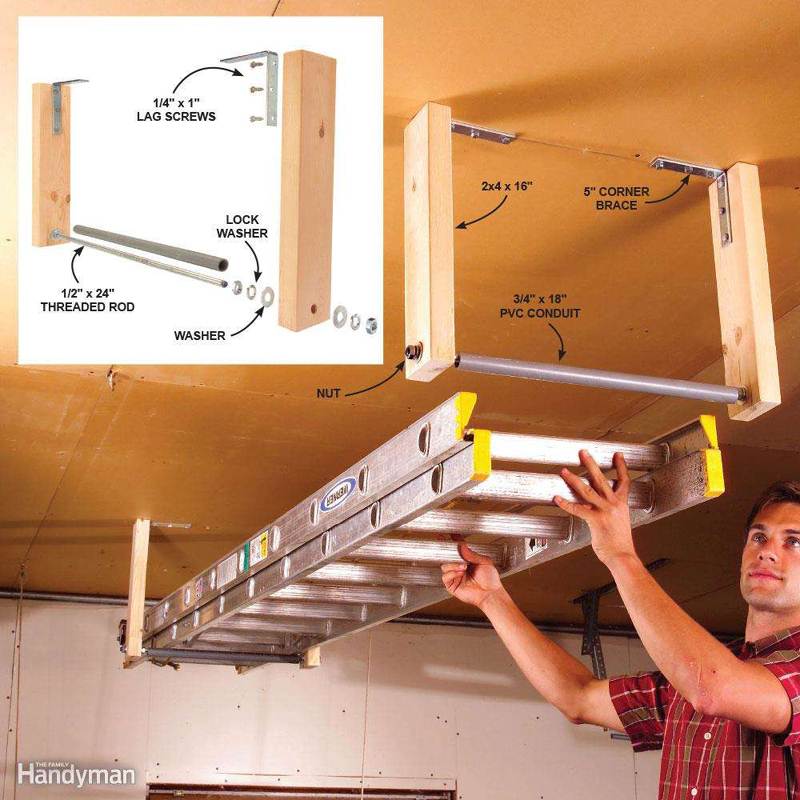 Hang ladders from the ceiling so they don't hog prime storage space. The rollers on this simple carriage let you easily slide in one end of the ladder, then the other. The materials you'll need are all inexpensive. Fasten the corner braces to ceiling joists with 2-in. lag screws. 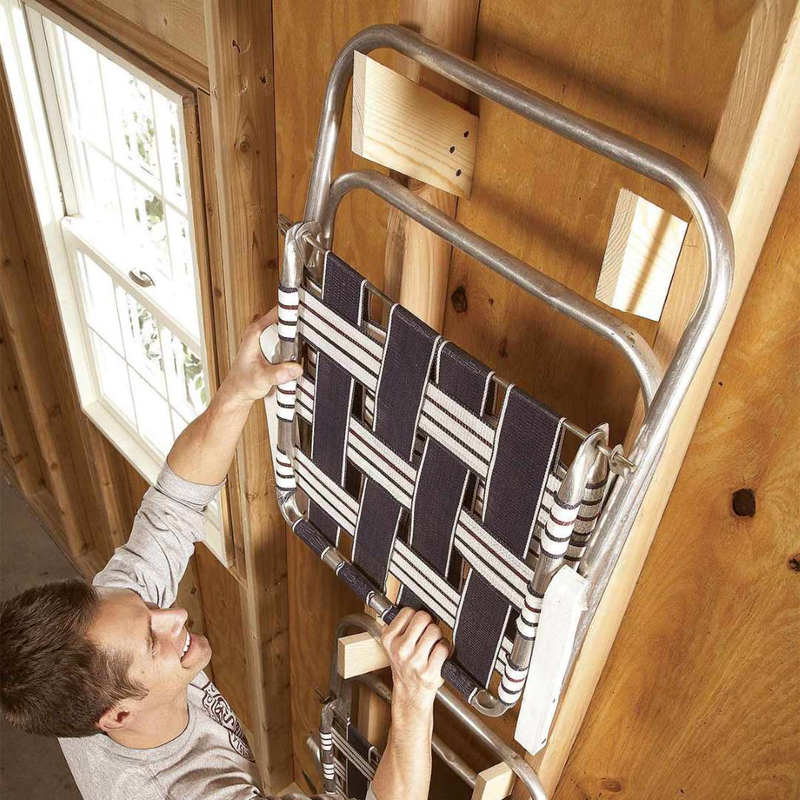 Secure the ladder with an elastic cord so it can't roll out and fall. 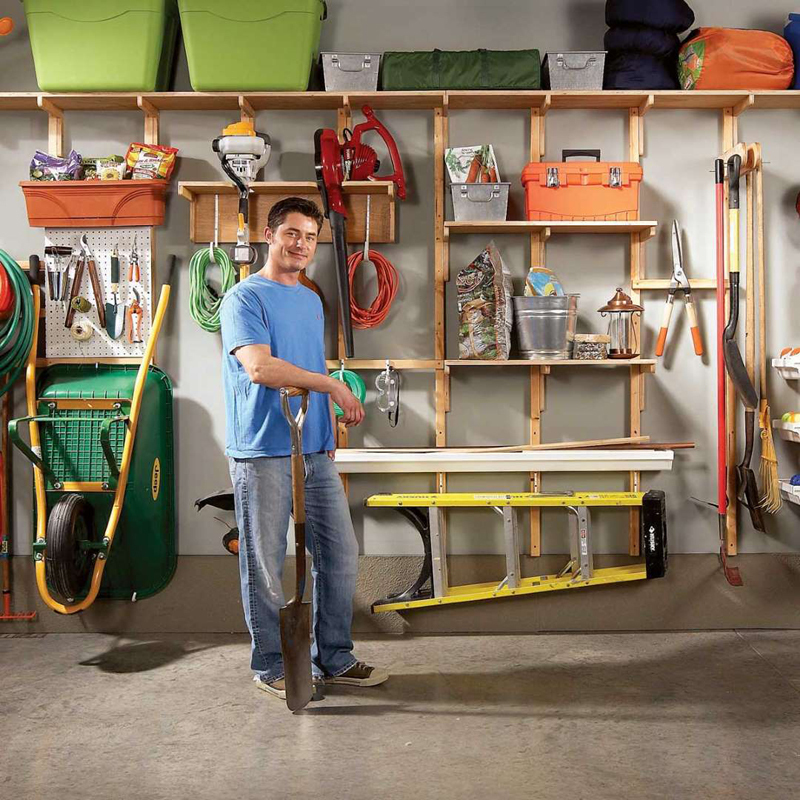 In just two hours you can Install pegboard on a garage or workshop wall to create versatile up-and-out-of-the-way storage. Add a bin underneath and you'll have a spot for all the odds and ends that cause clutter. 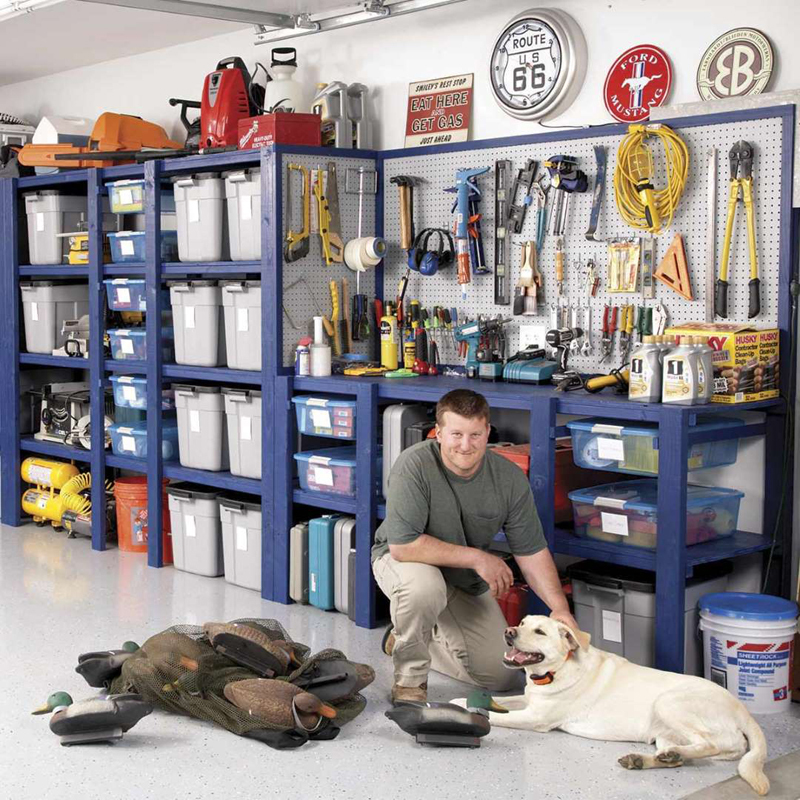 Floor space in most garages is hard to come by—so the best place to find storage space for garage shelves is overhead. 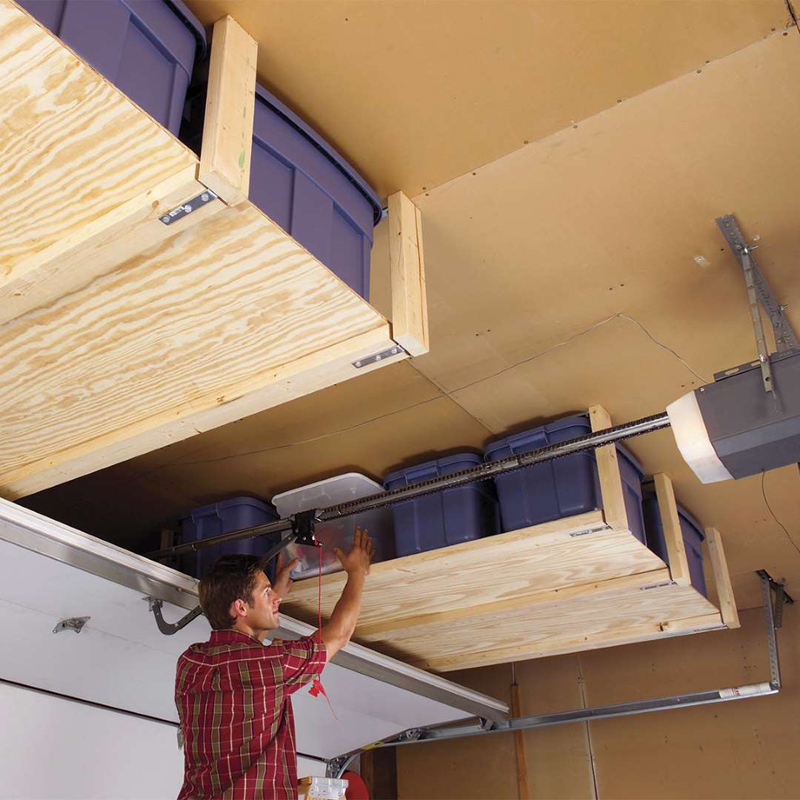 You can make your own DIY shelves for the garage easily—go double-decker for twice the storage capacity.